Come and enjoy fabulous South African hospitality with your hostess Morongwa Makakane as she takes you through the streets of Soweto. A full day tour comprising of a visit to the Nelson Mandela House, Hector Peterson Memorial and the Apartheid museum will leave you having a fuller appreciation of what really went on during those tumultuous years in South Africa pre 1994. To secure your place, please book and make payment by 31 March 2014. Space is limited. This famous sprawling township is home to over 4 million people living in peace and harmony. We will visit the original homes of Nelson Mandela and Arch Bishop Desmond Tutu. Both home are situated in Vilikazi Street, the only street in the world to have housed two Nobel Prize winners. 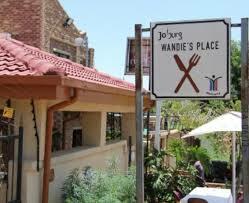 Our lunch stopover will be at Wandie’s Place, one of the most prestigious shebeens (restaurants) in Soweto. This tour of Soweto is not to be missed. In addition to the Soweto Tour, we will visit both the Hector Peterson Museum and the Apartheid museum. The Hector Pieterson Memorial in Soweto was erected in the early 1990’s as a memorial to Hector Pieterson, a 12 year old child, who is believed to have been the second school pupil shot by police during the Soweto Student Uprising on 16th June, 1976 – but the first fatality. The Hector Pieterson Memorial in Khumalo Street is a few hundred meters from the spot where Pieterson was gunned down. The Apartheid Museum opened in 2001 and is acknowledged as the pre-eminent museum in the world dealing with 20th century South Africa, at the heart of which is the apartheid story. A series of 22 individual exhibition areas takes the visitor through a dramatic emotional journey that tells a story of a state-sanctioned system based on racial discrimination and the struggle of the majority to overthrow this tyranny. For anyone wanting to understand and experience what apartheid South Africa was really like, a visit to the Apartheid Museum is fundamental. This cosy tavern in the middle of Soweto is popular with both locals and tourists alike. In the suburb of Dube, some 15km from the Jo’burg city centre, it has become a mandatory stop on the route for most Soweto tour operators. The restaurant has played host to such luminaries as Richard Branson, Evander Holyfield, Jesse Jackson, Quincy Jones and the All Blacks. For those who seek a touch of the exotic, the establishment serves indigenous cuisine in the form of dumplings, mogodu, ting (soft porridge), pap and umqushu (samp). 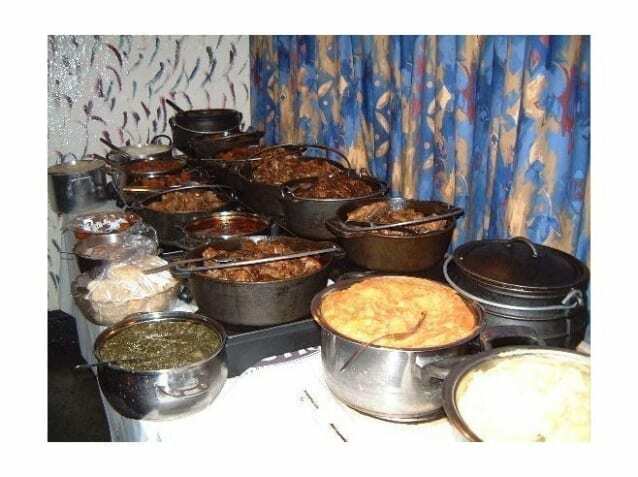 Meals are served buffet style and dishes include mutton, lamb, beef and chicken. Vegetarians are spoilt for choice, if salads are what you want. There are six on the menu, including coleslaw, French salad, beetroot salad, potato salad, tuna fish salad and chakalaka – a local hot salad made of tomatoes, baked beans, onion, chillies and green chillies.